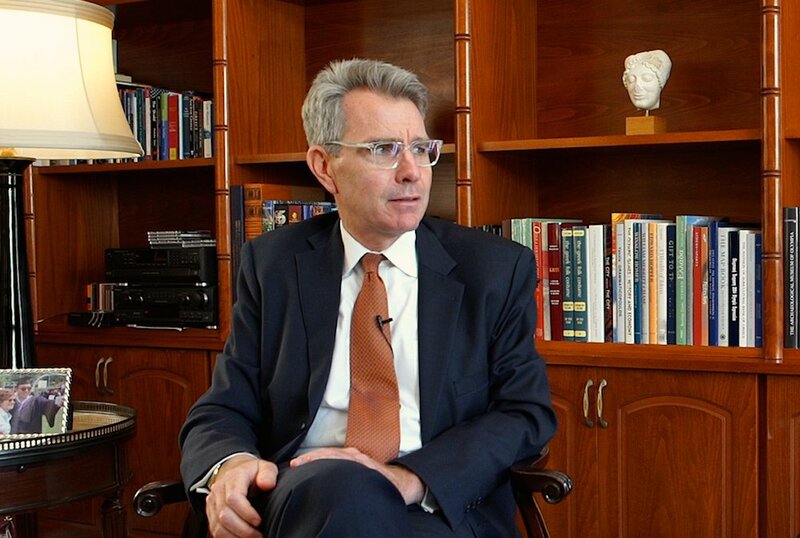 US Ambassador to Greece Geoffrey Pyatt sits down with Greek Reporter founder Anastasios Papapostolou to discuss USA – Greece relations, terrorist threats, as well as American investments in tourism, finance, and energy in the Mediterranean country. “The most important American goal in Greece is to see the country emerge successfully from this terrible seven-year economic crisis,” US Ambassador to Athens Geoffrey R. Pyatt said in an exclusive interview with the Greek Reporter. Speaking on September 8 at his Athens residence, Mr. Pyatt noted that Greece’s economic decline “has been on par with what my grandparents used to talk about, the American Great Depression.” The experienced diplomat expressed confidence that the process of recovery is now beginning. “The United States is interested in Greece’s success in this effort because you are a NATO ally“, Pyatt said. He stressed that throughout the current economic crisis there has been a very strong engagement of current and previous governments with Washington. “The US recognized that we have a stake in Greece’s success, that we have to work with the Greek government to encourage reform, work with American business to continue to grow the trade and investment relationship which is the engine, which will make the Greek economy sustainable,” Pyatt said. The US Ambassador stressed that the change of Administration in Washington will not change the strategic relationship with Greece. “There is strong bipartisan support in the United States, Republicans and Democrats, for our alliance, for what we’re doing in Greece“, he said. He acknowledged, however, that as new personnel come into position, there will be some changes and some new areas of emphasis. “But as a practical matter, there’s a great deal of continuity right now in terms of the bilateral relationship“, he noted. He emphasized however that Greece is a safe country. “It’s a safe and wonderful place for Americans to visit,” he stressed. Pyatt said he is encouraged by the interest American companies and the Greek Diaspora have shown in investment opportunities in Greece. From the banking sector, energy, construction and tourism the “potential is limitless“. He stressed however, that the government needs to create the enabling environment. The ambassador praised the recent investment by Calamos Investments in Ethniki insurance via the Exin group. He also referred to the interest of two American companies to purchase Syros’ shipyard, which according to Pyatt, “is a strategically important asset that we would like to see remain in the hands of investors from a NATO country“. The top US diplomat in Athens dismissed the notion that the US is against Chinese investments in Greece. He said however, that the important thing is transparency. “If there’s an honest competition and it ends up being a French company or a German company or even a Chinese company, that’s okay. What I worry about is when there’s no transparency“. “There are some other countries that have invested in Greece recently that don’t meet those high standards,” he noted. Pyatt acknowledges that there is concern in the northern Greece region that somehow the United States has disengaged. “There’s obviously been a lot of Russian investment, a lot of Russian activity. So I’ve been working so that there are alternatives. So that people in northern Greece understand the United States is going to remain engaged in that strategic region,” he said. Northern Greece is also important as an energy hub. The Trans Adriatic Pipeline (TAP) is of strategic importance, he argued. “I don’t think many people in Athens understand the scope, the ambition, the strategic impact of what Greece is doing with the Trans Adriatic Pipeline. It’s an awesome project,” Pyatt said. He says he is determined to engage with the government and the people to deal with some of the legacy of the past.